Caritas Internationalis is a global confederation of more than 160 organisations networked together in 200 countries, as part of the humanitarian and development mission of the Catholic Church. For financial information on individual members please refer to their own websites. The Caritas Internationalis General Secretariat (GS) provides coordination and support to the confederation. It is funded by contributions from member organisations and through private donations. Its finances are reviewed annually by an external auditor and a full annual report is available for download here. 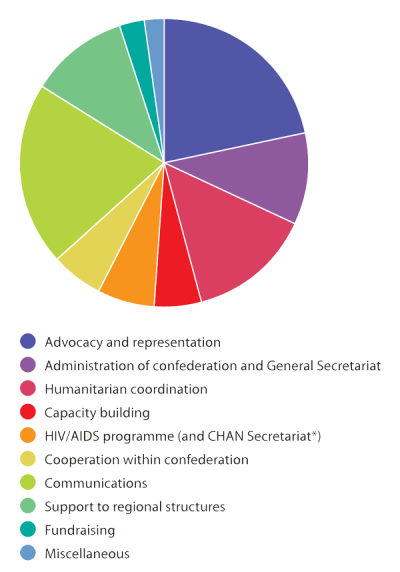 *The Caritas Internationalis office in Geneva serves as the Secretariat for the Catholic HIV/AIDS Network (CHAN).